TLC's flagship property (275 acres) is the first purchased and the most biologically significant. Home of a federally endangered fish and plant species. 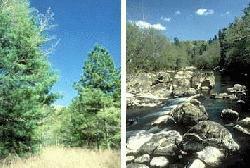 Located at the confluence of the Deep and Rocky rivers, White Pines is a great place to hike. The preserve supports several stands of white pines, a tree that is normally found in the cooler mountain region of North Carolina. Many other mountain plants and wildflowers including Catawba rhododendron grow at White Pines, too. The hiking trails offer beautiful views of the forest and the rivers. From Raleigh / Cary: Take US 64 west to Pittsboro and follow directions above from Pittsboro. Or take US 1 south to Sanford, take exit for US 15-501 north and follow directions above from Sanford. From Pittsboro: Go south on US 15-501 for 8 miles from the Chatham County Courthouse traffic circle. Turn left on River Fork Road (SR 1958), the first left after crossing the Rocky River bridge. On River Fork Road, turn right immediately and proceed for 1.7 miles. Turn right at the stop sign and continue 0.5 miles to the TLC Preserve sign. Turn left and drive about 1/8 mile to the parking area on your right, or park along the road (being careful to avoid blocking the right of way). From Sanford: Take US 1 to US 15-501 and proceed north for 8 miles. From 15-501, turn right on River Fork Road (SR 1958), the first right after crossing the Deep River bridge. On River Fork Road, turn right immediately and proceed for 1.7 miles. Turn right at the stop sign and continue 0.5 miles to the TLC Preserve sign. Turn left and drive about 1/8 mile to a parking area on your right, or park along the road (being careful to avoid blocking the right of way).